I’ve read through a lot of lists of top delay pedals and what other websites believe is the best delay pedal. You have probably seen a lot of lists on the top 10 delay pedals and whenever I read through them I’m always disappointed. Every guitarist has different needs when it comes to gear and delay so it’s ridiculous to claim that there is one pedal that is the best. Whenever you read a top 10 delay pedal countdown – ignore it because you can’t directly compare all delay pedals. In this buyer’s guide, you will learn how to find the right delay pedal for you. I will explain what to look for and offer suggestions on what delay pedals might suit you and your needs. By the end you will know exactly how to find the right delay pedal for you and you will be able to make an informed decision. What is important to you in a delay pedal? There are countless delay pedals out there so it’s a tough job to sort through them all to find the delay pedals that stand out. Some delay pedals have one footswitch and only one delay type while others have four or more footswitches and allow you to program countless presets and combinations of delay settings. Have a think about what is important to you in a delay pedal. Do you want something simple or do you need a lot of flexibility? Do you want to have multiple delay types instantly available or are you looking for one type with a really unique sound? Everybody will answer these questions differently which means everybody will have a different ‘best delay pedal’. Value: how much do you want to spend on a delay pedal? Simplicity: do you want an easy-to-use pedal without all the bells and whistles? Flexibility: are you looking to achieve one main delay sound or do you need to be able to tweak and switch between different delay types? Precision: do you want to be able to set a specific delay time to an exact BPM or do you want to tweak each parameter precisely? Size: does the size of the pedal matter to you? Are you happy to have a monster take up half your floor space or do you want to keep things small and simple? Think about the above points as your answer to each one will change what type of delay pedal you should look for. If you know what features you want in a delay pedal, it’s far easier to find the right pedal for you. Let’s run through the most common features and whether you may want to consider them. Not all features will be relevant to you and no pedal will have all features. So think about which features are the most important to you and which ones you don’t care for. The debate between digital and analog is an old one and there are many heated debates constantly raging online. If you have a preference for one over the other, that’s fine. There are plenty of pedals on either side to choose from. I won’t say one is better than another and all I’ll say is that technology has improved at a ridiculously rapid rate. That means that the pedals available today (both analog and digital) mostly have excellent quality tone. If you find an older model digital pedal, you are likely to notice a poorer quality effect due to the limitations of past technology. Today the digital pedals available are so high quality that blind tests stump most guitarists. The choice between digital or analog is a personal one you will need to decide. Generally speaking, digital delay pedals offer more flexibility in terms of delay types, presets and other features while analog delay pedals tend to focus on one delay type (or a low number of types) and focus on producing a good quality tone. If you’re unsure which to go for, decide on other features first, then look at what type of delay pedals offer those features. Many guitarists find out the hard way how useful this feature is. It’s typically a footswitch or a button you tap repeatedly to set the delay time. Some delay pedals give you the option between a knob and a button/footswitch to set the delay time while others only give you a knob. A delay pedal with a tap tempo button or footswitch is very useful (while not essential) because you can easily match your delay time to a specific tempo. This is important for rhythmic effects. 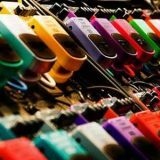 You also need to consider whether you would be happy to use a button to set the tempo or whether you need a footswitch. If you play live, then a footswitch is useful because you will be able to set the delay time while playing. Bending down to change the delay time isn’t very practical during a live performance. There are times when a tap tempo function isn’t that important. If you have a delay pedal where you can save presets, then you can simply set the specific time for each preset without having to worry about tapping it out each time you need to change. Some delay pedals work with a PC/Mac editor or smartphone app which gives you a different way to set the delay time. Some delay pedals allow you to set an exact delay time down to the millisecond. 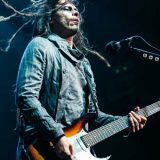 While not all guitarists need this level of precision, it is useful if you want to use your delay to create rhythmic effects that match a song’s tempo. While you can get close with a tap tempo, it can often lead to out-of-sync effects that ruin the vibe. Most pedals that have an inbuilt screen (eg: Strymon Timeline, BOSS DD-500, or multieffects pedals like the Line 6 HD500X) will allow you to set an exact delay time in milliseconds. Other pedals such as the Flashback Delay range can also set exact delay times by using their TonePrint app. To work out the exact delay times needed for any tempo, use this Delay Time Calculator. This is an important decision because it changes what type of delay pedal you look for. Some delay pedals such as the MXR Carbon Copy only focuses on one delay type. Usually analog pedals focus on one delay type while digital pedals typically offer multiple types. For many guitarists, they only need a simple delay and don’t need any fancy delay effects or different types. The important point to remember here is that if you buy a pedal with only one delay type and in the future you want to use different types, it means you need to buy more pedals. On the other hand if you have a pedal with different delay types and effects available and you find a song that uses one of those effects, it’s already available so you don’t need to find more gear. To give you an idea of what type of delay types/effects are available, here is the list of types from the TC Electronic Flashback X4: tape, tube, space, analog, analog with modulation, reverse, dynamic, 2290, 2290 with modulation, slap, lofi, ping pong. This is an important consideration because not all pedals allow you to save your own presets. Presets are handy when you want to quickly and easily switch between different delay settings. Let’s say you have a song where you want a slow and subtle delay and another song that uses a loud slapback delay. Presets allow you to save the different settings and instantly switch between them (usually from a footswitch). If you are looking for a delay pedal with multiple delay types and effects, it’s a good idea to look for one that also allows you to save presets. While you can get away with bending over and adjusting a few knobs, being able to save the exact settings you like is a great feature. Of course, if you are looking for a delay pedal that only has one delay type, presets won’t be very important to you. Many delay pedals offer a built in looper. As a guitar teacher I highly recommend every guitarist own a looper and if you don’t want to spend money on a standalone looper, then owning a pedal with an inbuilt looper is a great alternative. A looper is an excellent practice tool but it’s also a great songwriting or live performance tool. Some loopers in delay pedals offer only basic features while others give you all the features you would find in a standalone looper. You will only find inbuilt loopers in pedals that offer multiple delay types so if you only want a simple delay pedal, then consider buying a separate looper. The most basic delay pedals usually have three controls: Delay Time, Delay Feedback and Delay Level. Those three controls allow you to set the basics for your delay. But there are other important parameters to consider depending on the type of effect. Being able to control other aspects such as depth, filter, speed, etc. can give you so much control over your tone. When you use a delay pedal with only three controls then move across to a pedal that allows you to control every aspect of an effect, you realize how the extra control can shape your tone. Not everybody will want full control over every single parameter thinkable, but it’s an important feature to consider. Many new pedals offer the ability to connect to a computer or smartphone and use an editor to set up your own presets and adjust the settings. Again this is a personal choice and you may not be interested in that much control. But it’s worth considering if you’re a live performer or like to have full control over your tone. If being able to set a specific delay time to the millisecond or being able to save presets for access later is important to you, then it’s worth looking for a pedal that has this feature. As mentioned at the start, a top 10 list or best pedal is ridiculous because everybody has different needs. So in this section I will list different categories to consider and present an example of a pedal worth considering that matches that category. The pedals I list below are all excellent quality and highly recommended. But as I’ve mentioned, there are countless delay pedals out there so use my suggestions as a starting point and if you find another pedal that meets your needs, then that pedal is the best for you. 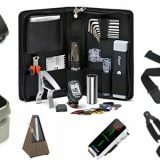 This is a buyer’s guide so use it as a guide. For rock music, a simple delay pedal with a warm sound usually works best. 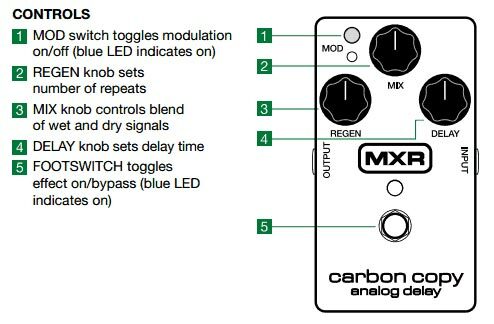 If you want a great sounding delay pedal and you don’t care about the other advanced features listed above, then I recommend considering the MXR Carbon Copy (full review here). It’s an analog pedal that focuses on producing a warm sounding delay and it does a great job at that. You can see from the below diagram that it doesn’t get much simpler than this. While it is incredibly simple to use, the addition of the modulation button on the top left gives you some flexibility to your tone. The Carbon Copy has been an incredibly popular delay pedal with rock guitarists (as well as other music styles) and it’s mainly due to its simple features and excellent quality. Of course, there are other simple delay pedals, but the Carbon Copy is a good starting point if you’re looking for a good quality delay pedal for rock. I also highly recommend the Carbon Copy for metal. If you’re a metal guitarist, check out this guide on the best pedals for metal for more information. Check out the Carbon Copy here for more details and price. There have been great delay pedals developed over the last few years with a focus on flexibility. You now have a wide range of features that were not possible previously. 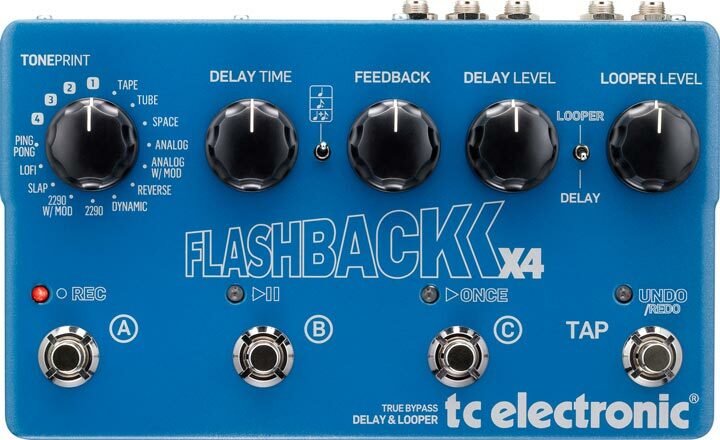 The best example of a flexible delay pedal is the TC Electronic Flashback X4. The Flashback range of delay pedals pack in a great range of features and the X4 gives you the most flexibility. I reviewed the X4 and compared it to the Line 6 DL4 (another good option for flexibility) and in many ways, I felt the X4 was superior. For a live situation, this is an excellent delay pedal because you can easily assign different presets to the footswitches and move between them instantly during your performance. It has a dedicated tap tempo footswitch which removes the need to bend over to adjust the delay time. In terms of flexibility, it’s hard to find another delay pedal that matches the X4 without having to spend a lot more money. The best feature, in my opinion, is the TonePrint when used with a smartphone or computer. As explained in my review of the Flashback X4, it is ridiculously easy to customize a preset and beam it to the pedal using your smartphone. In terms of flexibility, the Flashback X4 wins hands down. Check out the price and full details of the Flashback X4 here (link to Amazon). Many delay pedals allow you to save presets. Multi-effects pedals such as the HX Effects are perfect for this as you can save as many presets as you need. 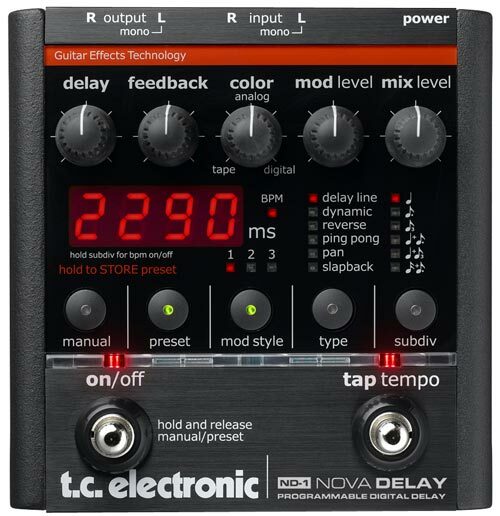 One pedal that stands out for its use of presets is the Nova Delay by TC Electronic. The Nova Delay is promoted as a ‘Programmable Digital Delay’ and that label really fits. You’re able to save independed delay times for each preset or you can share a delay time between presets. Sharing delay times across presets is a great way to access different delay effects while keeping the delay times synced to the song you’re playing. When you look at these features altogether, it becomes clear that while the Nova Delay may not have the same flexibility as the Flashback X4 (for example the Nova only has 6 delay types), what you lose in flexibility you gain in ease of use and preset control. Check out the price and details of the Nova Delay here. This is the only pedal in this guide I haven’t personally played and at its price, I won’t be getting one any time soon. 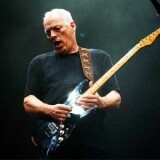 But it has a massive following and ambient guitarists rave about it. 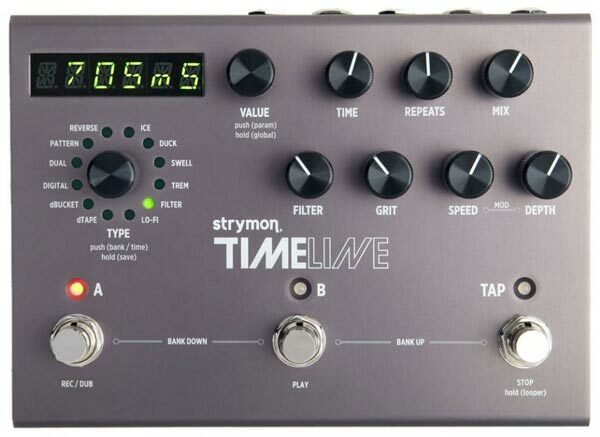 The Strymon Timeline is a very expensive delay pedal but apparently, it’s worth the money. 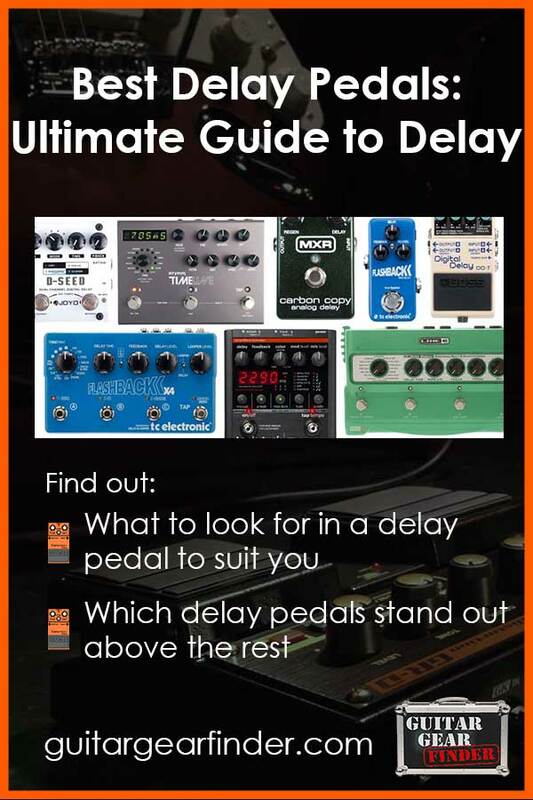 It’s the most expensive delay pedal in this guide by far but if you don’t care about price and want the best, a lot of guitarists feel it’s the best out there. I would love to get my hands on one to give you better insights and to review it, but until I do, I can only go on what I’ve heard from other guitarists. From a tap tempo footswitch to being able to set an exact delay time to the millisecond, the Timeline gives you precise control over your delay. The knob to the left lets you choose between a nice range of delays, which perfectly suits ambient guitarists. Well designed and a wide range of features, it’s hard to imagine any way the Timeline would fall short compared to any other delay pedal. It has a built-in looper and plenty of controls to adjust every parameter for each delay type. Even if you already have a dedicated looper pedal, having an inbuilt one in a delay pedal lets you experiment with two independent loopers at the same time. Check out the price and full details of the Timeline here. There are countless cheap delay pedals out there and even more when you look at second-hand gear. But I wanted to find a cheap pedal that still packed a good punch in terms of quality and features. It was easy to find simple delay pedals that give you one sound and three controls but most of them felt poorly made or lacked quality in tone. 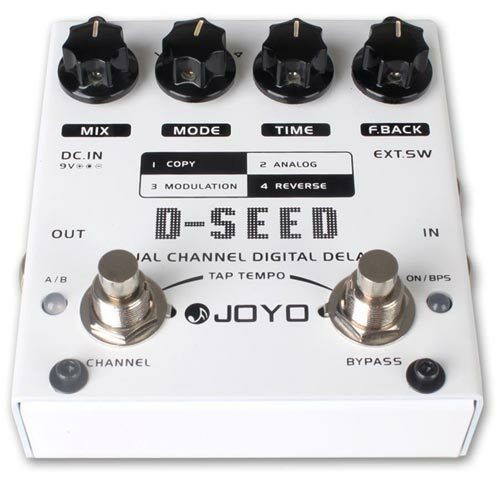 Then I found out about the JOYO D-SEED because one of my students bought one when they saw how cheap it was. I am familiar with JOYO and their clone of the Fulltone OCD, the JF-02 Ultimate Overdrive, really surprised me. I’m really surprised with the features this cheap pedal packs in. When you compare the list of features to the price and try to find a different delay pedal with the same features, you’ll see why this is the best delay pedal in terms of value. Of course, the quality and features don’t compare to the above pedals, but when you consider you’re saving literally hundreds with the D-SEED, it’s a good buy. If you’re a beginner looking at getting in to delay or have a low budget for guitar gear, the D-SEED gives you plenty of features and flexibility without the high cost. There are plenty of cheaper delay pedals, but I haven’t seen anything that compares to the D-SEED. Check out the price and details of the D-SEED here. Most of the above pedals give you a lot of different options and allow you to easily change back and forth between different delay effects. But what if you want to use delay only for your lead tone? Adding delay to your lead tone is a great way to thicken up your tone when you get into a solo or lead section. The delay can add some character to what could be a thin and weak sounding solo. There are plenty of simple delay pedals to fit this need. A lot of guitarists use BOSS delay pedals such as the DD-7 to thicken up their lead tone. The reason the Flashback Mini wins for lead tone is thanks to TonePrint. As explained earlier, TonePrint allows you to use an app on your smartphone or the editor on a PC/Mac and customize your delay settings. While the Flashback Mini doesn’t give you flexibility in terms of switching between different presets, it does allow you to set the perfect delay you want in the TonePrint editor and save it to your pedal. So while there are only three knobs and only one delay type available at a time, you have plenty of flexibility. For example, maybe the tape delay fits your current tone tastes. You can set the delay type to tape, then you’re able to adjust the three knobs to suit your needs. Later on your tastes may change and you may prefer an analog style delay with some slight modulation. Simply set it up in TonePrint and you’re good to go. I recommend this pedal over other basic delay pedals because you’re not going to outgrow it. Even if you have simple delay needs, it still gives you plenty of flexibility. For lead guitar, a simple delay pedal can do wonders for your tone. Some guitarists have a dedicated delay pedal for lead, then a separate delay pedal for other delay effects. 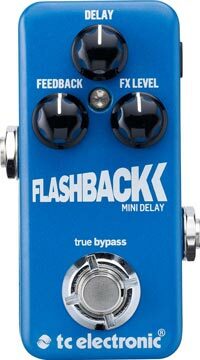 Check out the price and details of the Flashback Mini here. Value: a multi-effects pedal will cost more than any of the above delay pedals, but you get far more for your money. Not only will you gain access to every type of delay you could possibly want, but you can also access a wide range of other effects. If you don’t like the idea of spending over a thousand dollars on effect pedals, consider a multi-effects pedal. Versatility: most multi-effects pedals will give you far more choices for delay types and settings than all of the above pedals. The Line 6 POD HD500X gives you 14 delay types and you can control every parameter and save it to separate presets. You can even set the expression pedal to dynamically control different parameters while you play. Not just delay: in a standard multi-effects pedal you also get a range of effects such as: distortion, dynamics, pitch, modulation, filter, reverb, wah, volume, EQ, etc. When you see guitarists with massive pedalboards filled with pedals, that still doesn’t come close to what a multi-effects pedal can give you. Presets: while some of the above pedals give you the ability to save a few presets, multi-effects pedals give you all the preset and customization space you would ever need. As a live guitarist, this can mean you can have a separate bank of presets for every song you play – avoiding the need to tap dance on your pedals in-between songs. Of course, single-effect pedals vs multi-effect pedals is a personal choice and it’s foolish to say one is superior to the other. Each option gives you different choices and the right choice for you is the one that meets your needs. If you’re interested in a multi-effects pedal instead of a standalone delay pedal, check out my reviews on multi-effects pedals here. By now you will have a good idea what features are important to you and you have a few different examples of the best delay pedals worth considering. Click the links above to read other reviews on Amazon for those pedals or check out my reviews on them to find the best delay pedal for you. Once you get yourself a delay pedal, check out my lesson on slapback effects to get started using your new delay pedal. I’ll be creating more lessons soon so be sure to subscribe to my newsletter to receive lessons and guides like this in the future. If your delay pedal allows you to set an exact delay time in milliseconds (ms), use this Delay Time Calculator to work out the delay times needed for different note lengths at any tempo. This is a great way to start experimenting with rhythmic effects that match a song’s tempo. This buyer's guide explains how to find the best delay pedal for you. There are countless delay pedals out there and there is no one best pedal. So find out how to find the right delay pedal that meets your needs.